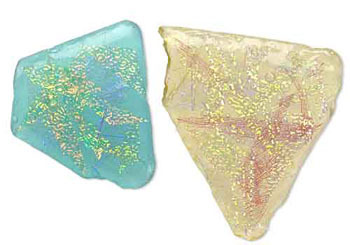 Squeeze a few drops of the liquid glass onto the sea glass--enough to cover the surface. Using your finger, move the liquid around so it covers the entire area. Tip: Make sure there are no bubbles; if there are, poke them with a fine-tipped needle. Using scissors, cut snips of the Luminous Elements then add to the liquid, creating a design pleasing to your eye. The Luminous Elements will stick to the liquid. Let this layer dry. Tip: Drying time depends on the temperature of the room; you will know it is dry when it is no longer tacky. Repeat this process as many times as you desire, layering the Luminous Elements until you are satisfied with the look. Add one last coat of the liquid glass to seal in the Luminous Elements. Using scissors, trim any stray edges of Lumious Elements or excess Faux Dichro. You can also use polishing papers to remove excess Faux Dichro. To incorporate your Faux Dichro design into a finished piece of jewelry, consider wire-wrapping or gluing on a bail.